هتل سنت رافائل ریزورت در ساحلی تمیز و آرام در لیماسول قرار دارد ، این هتل دارای 2 استخر روباز ، اتاق های مجهز به تهویه کننده هوا و بالکن هایی با نما به سوی دریای مدیترانه می باشد رستوران فونیسین غذاهای گریل و محلی را سرو می کند. میهمانان می توانند از خدمات اسپا و زمین تنیس این هتل استفاده کنند. برای کودکان نیز زمین بازی اختصاصی وجود دارد. هتل سنت رافائل 11 کیلومتر از مرکز لیماسول و 45 کیلومتر از فرودگاه لیماسول فاصله دارد. اینترنت رایگان در محوطه عمومی هتل و اتاق ها در دسترس می باشد. هتل سنت رافائل ریزورت یکی از جمله هتل های مناسب و مجلل است که مسافران قبرس می توانند این هتل را در لیست هتل های اقامتی خود مورد مقایسه قرار دهند. خدمه های دلسوز و مهربان از مشخصه این هتل هستند. شما می توانید اتاق هایی متناسب با علایق و سلایق و تعداد اعضای همراه خود در این هتل انتخاب کنید و این خدمه ها شما را راهنمایی کنند. اتاق های پاک، اتاق مخصوص زوج، اتاق های ویژه معلولین همه و همه مکان هایی هستند که مسافرت شما را بهتر و بهتر می کند.. اتاق های هتل سنت رافائل ریزورت دارای کفپوش پارکت و امکاناتی مدرن می باشد. تمامی اتاق ها تلویزیون LCD و ماهواره و مینی بار دارند. صبحانه به صورت بوفه در رستوران اکتاگون سرو می شود. امکانات رفاهی که در این هتل در اختیار مسافران عزیز قرار دارد شامل اتاق های ماساژ، استخر روباز برای آب تنی، سونا و مرکز سلامت و آب گرم برای آب درمانی، سولاریون و استخر سرپوشیده برای کسانی که به استخر رو باز علاقه ندارند. غواصی هم یکی از امکاناتی است که در کمترین هتلی دیده می شود اما در ست رافائل ریزورت برای شما فراهم شده است. برای کودکانتان هم این خدمه ها فکری کرده اند و از آن ها نگهداری می کنند. اتاق های بازی های رایانه ای برای بچه های شما فراهم است تا اوقاتی که در هتل هستند به هدر نرود. برای خرید لوازم مورد نیاز خود هم نیازی نیست اصلا از این مکان و هتل خارج شوید چرا که هتل دارای فروشگاه های متعدد و متنوعی است که می تواند شما را حسابی از هر نظر راضی کند. علاوه بر این اجناس مرغوبی هم در مراکز خرید قبرس وجود دارد که می توانید از آن هم خرید کنید. اگر به دنبال اتاق کنفرانس هستید می توانید از اتاق ویژه هتل و سالن ضیافت آن استفاده کنید. برای گشت داخلی قبرس هم می توانید از گشت های این هتل در شهر لیماسول استفاده کنیدآرایشگاه مردانه و زنانه هم در این هتل وجود دارد تا آسایش شما کامل شود. اگر پینگ پنگ دوست هم باشید که می توانید از سالن پینگ پنگ آن استفاده کنید. هتل سنت رافائل ریزورت را به صورت آنلاین رزرو کنید! Welcome to the St. Raphael Resort...a hotel that guarantees you only the best, with modern facilities and luxurious surroundings, our aim is to provide high standards with that extra touch of Mediterranean hospitality. For those guests who prefer fresh water, the hotel features two outdoor freeform swimming pools and one indoor pool. One of the outdoor leisure pools features the Amphibion Wet/Dry Pool Bar while the second outdoor pool in the new Executive Wing has its own water slide and separate shaded children’s pool. Serving international themed buffet dinners with live musical entertainment several times a week, this glamorous restaurant is the ideal location to indulge in some of the best cuisine from around the globe. The Palladium boasts high ceilings which are hand-painted with the twelve Ancient Greek gods and breathtaking views of the sea and marina. Open everyday, the Octagon Restaurant serves full American Buffet Breakfast with a huge array of displays to choose from. During lunch time, the Octagon serves as the main restaurant with an international buffet, carvery, salad bar and dessert selection that will tempt even the most discerning guest. In the evening, this delightful restaurant becomes an Italian quarter with choices of homemade pasts, pizzas and salads. A fusion of Mediterranean and Arabic cuisine served as a meze. This sumptuous treat includes a variety of starters, pastries and grilled meats of the best of the Mediterranean and Middle East. The atmosphere of the Phoenician restaurant is yet to be surpassed, boasting high ceilings, original mosaic features and genuine antique decorative items from the Middle East. The perfect outdoor restaurant for those who would like to have a casual atmosphere while dining by the new outdoor swimming pool of the executive wing. Ideal for families with children of all ages, this relaxed restaurant serves a variety of fast food with a ‘make your own salad’ bar, and is open during lunch and early dinner. Serving a variety of barbequed meats and grills with a fresh salad bar and selection of the island’s best fruits, there can be no better location for those who wish to enjoy the feel of the sea and beach. Ultimately casual for a bite in between dips in the sea or pool, this restaurant also has it’s own bar where guests can order beverages while relaxing in the sun. The Captain’s Bar, with its’ nautical theme and elevated view over the Mediterranean sea, offers guests the perfect retreat while enjoying a drink or snack. The bar has its own wooden decked terrace overlooking the hotel’s beautifully kept gardens and Marina. The staff are well known for their interesting cocktail favorites and there is live music six times a week in the evenings. The wet and dry Amphibion Bar has been a symbol of St. Raphael Resort since the hotel first opened in 1997. All guests enjoy swimming up to bar and ordering a long awaited cocktail while bathing in the beautiful Mediterranean sun and talking with friends on the other ‘dry’ side of this well known bar. Ice-creams and all types of beverages are served here with smiling faces. The Sailor's Rest Lounge Bar Restaurant was re-launched in summer 2008 after an amazing re-creation of Limassol’s favourite ‘hot spot’. Situated in the unique location of the St. Raphael Marina, offering spectacular views over the Mediterranean sea and yachts, the restaurant serves an array of gourmet cuisine with fresh fish, meats, salads and pasta, not to mention mouth watering desserts and ice-creams that are available throughout the day. Coffee and drinks can also be enjoyed with resident dj's performing during the summer months on Wednesday, Friday and Saturday nights. There is always something for even the most active sports enthusiast to enjoy at St. Raphael Resort. Apart from swimming in either one of our two outdoor or one indoor pools, the hotel also has table tennis, workout programmes, darts, French bowls, Archery, a fully equipped gymnasium with the latest equipment, beach volleyball, badminton, two artificial grass tennis courts (it is also possible to rent rackets and tennis balls), sauna, steam bath, Jacuzzi, scuba diving and all types of water sports at the beach. Other syndicate rooms are available for meetings or seminars for 10 to 20 guests. Whether large or small, your group will enjoy staff's professionalism and organizational skills, as well as complete and impressive catering services. * Of the 272 rooms and suites, 216 have been completely renovated and the new addition of the 56 executive rooms has ensured that every type of guest can find the facilities to suit them. From deluxe admiral suites, marina-view rooms, standard sea-view rooms, executive/ family rooms and Inland view rooms, there is a category and price to suit everyone. All rooms are equipped with 26 inch flat-screen televisions with satellite, pay movies on demand and play-station games, complimentary coffee and tea making facilities, direct-dial telephones, radio, safes and mini-bars. The en-suite marble bathrooms are fitted with every amenity, while the carefully designed building allows 90% of the rooms a breathtaking view over the Mediterranean Sea which one can enjoy from their private balcony. The St. Raphael Resort is located on one of the most renowned and largest beaches in Limassol. The clear blue sea water and silver sands, ensure that all guests can enjoy a dip in the Mediterranean sea and relax by the calm waves. 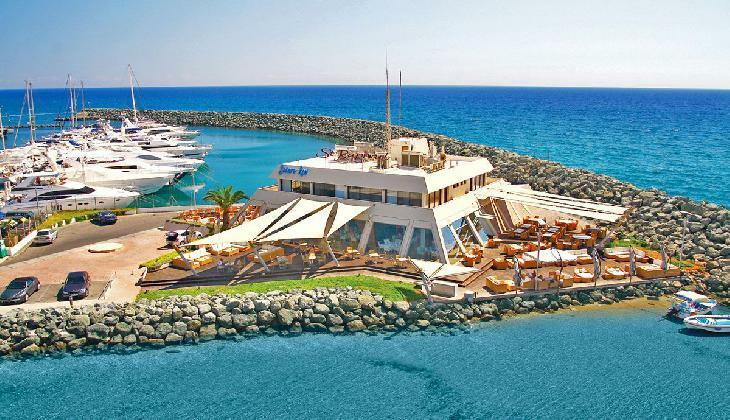 The hotel is found in the beautiful Amathus Area of Limassol, approximately 11km from the town centre, set within 43,000m2 of beautifully landscaped gardens and boasting it’s very own 237 berth Marina. The breathtaking views and luxurious marble surroundings are just a few of the features that ensure that clients enjoy their stay at this hotel and look forward to returning again in the future.